Based on the popular BBC2 series of the same name, Wonders of the Solar System takes readers on a journey of discovery, transforming alien worlds from their imaginations into places they can see, feel, and visit. From the giant ice fountains of Enceladus to the liquid methane seas of Titan, and from storms twice the size of the Earth to the tortured moon of Io with its giant super-volcanoes, this exhilarating book presents the Solar System as readers have never seen it before. With a clear, authoritative, yet down-to-earth approach, the authors explore how these previously unseen phenomena have dramatically expanded mankind’s horizons with new discoveries about the planets, their moons, and how they came to be the way they are. 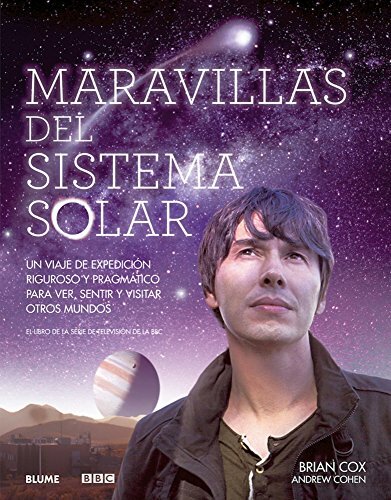 Basado en la serie popular del mismo nombre de la BBC, Maravillas del Sistema Solar lleva al lector por un viaje de descubrimiento, transformando mundos ajenos de su imaginación en lugares que puede ver, sentir y visitar. Desde los descomunales surtidores de hielo de Encélado hasta los mares de metano líquido de Titán, y desde tormentas que duplican el tamaño de la Tierra hasta la vapuleada luna Ío con sus supervolcanes gigantescos, este estimulante libro le presenta el Sistema Solar al lector como nunca lo había visto previamente. Con un tono claro, autorizado pero pragmático, los autores exploran cómo estos fenómenos, no observados con anterioridad, han ampliado los horizontes de la humanidad con descubrimientos sobre los planetas, sus satélites y cómo llegaron a ser como son. Brian Cox is a particle physicist, a professor at the University of Manchester, and a Royal Society research fellow. He is a researcher for the ATLAS experiment at the Large Hadron Collider in Switzerland. He is also the presenter of the BBC2 series Wonders of the Solar System. Andrew Cohen is the director of the BBC’s science unit and the executive producer for the BBC2 series Wonders of the Solar System.